You will be picked up at your hotel and taken to the airport where you will board your airplane for the flight out to the Grand Canyon. After take off you will have great views over historic Boulder City, Lake Mead and the Hoover Dam. As you approach the Grand Canyon you will start to see extinct volcanoes and the Grand Wash Cliffs. After landing you will be taken to your helicopter, for a 4000 foot descent through the walls of the Grand Canyon itself, to the bottom. At the Colorado River you will hop onto a pontoon boat for a short 10 to 15 minute ride along the river. 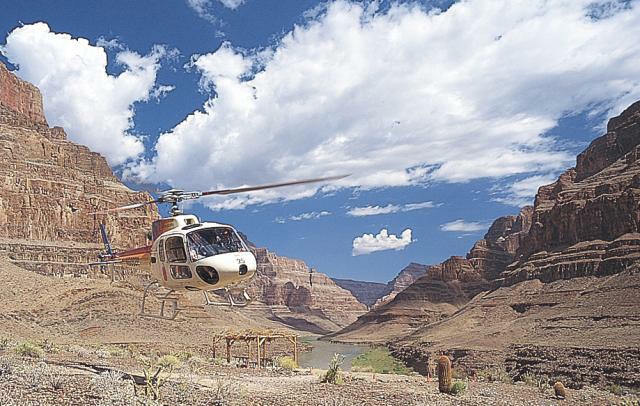 It's then time for another helicopter ride, this time up to the top of the Grand Canyon, from where a motor coach will take you to the rim for a light meal. You can gaze down to where you had previously landed 4000 feet below. After touring the Canyon you will get back into your airplane and fly back to Las Vegas.